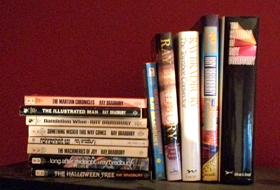 I can still remember my first introduction to Ray Bradbury. It was in high school, and we were assigned The Martian Chronicles in lit class. I read it straight through. Then, I took it home and introduced The Martian Chronicles to my Dad. He was a psychologist, and I asked him to read a selection called “The Earth Men,” in which the first astronauts on Mars are thought to be hallucinating psychos and are promptly locked up in an insane asylum. My Dad, ever affirming my interest in reading, sat down that night after dinner and read the short story instead of watching the news. We then engaged in a discussion about why we liked it – the subversively misleading story line, the writing style, the unexpected conclusion. It’s a favorite memory of my father. So I was saddened to hear of Bradbury’s death on Wednesday, and felt a little like I’d lost an affable father-figure, a story teller whose insight into the wishes and dreams and fears of children somehow became inextricably entwined with my own season of growing up. Bradbury was called a Science Fiction writer, though it was not in the slimy-drooling-monster, man-eating blood-gushing style of today. He wrote to our simple fears – walking home alone at night (Dandelion Wine), the unexplained prickling of the hair raising on your arms or neck (Something Wicked This Way Comes) – as well as human emotions such as the longing for home… while viewing it in the sky from a settlement on Mars. 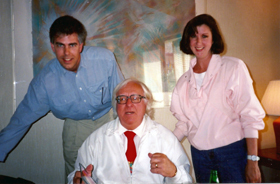 I actually met Ray Bradbury in 1992, in Lake Arrowhead, California, when he was 70 and had already been writing for 50 years. My then-husband and I attended a lecture, and waited in a very long line to get an autograph and take a picture. I had him sign a 40th anniversary edition of The Martian Chronicles, which I gave to my Father as a gift that Christmas.